While USDA loans share many qualities with other government loans, such as FHA and VA, they also include many unique requirements and characteristics which can be confusing for first-time home buyers or borrowers who are unfamiliar with the mortgage application process. 1. What is a USDA home loan? A USDA loan (also referred to as a USDA Guarantee Home Loan or a Rural Development Loan) is a type of mortgage loan that is guaranteed by the U.S. Department of Agriculture. Initially created during the Great Depression to provide assistance for farmers, USDA loans include many beneficial qualities for qualified borrowers, including no down payment, lenient credit criteria, and reduced mortgage insurance compared to other loans. 2. Are USDA loans only for first-time homebuyers? No, the USDA does not impose any borrower restrictions regarding previous homeownership. 3. How much can a USDA loan finance for home purchase? USDA loans can finance a home purchase entirely, meaning borrowers are not obligated to pay a down payment. While the government charges a 2.0% guarantee fee for Rural Development loans, the USDA also finances up to 102% of the mortgage, allowing borrowers to include closing fees or a portion of the guarantee fee within the loan balance. 4. Are USDA guaranteed loans solely for low-income borrowers? No. While USDA loans can benefit low-income borrowers tremendously, buyers with higher income can apply for USDA loans as well. Regarding income limits, the USDA will approve any borrowers with an income that does not exceed 115% of the median income in the area, based on your family size. For example, if the median income of USDA-approved area averages at $100,000, eligible borrowers must have an income of $115,000 or less. To find out the USDA income limits in your region, visit the official USDA Income Eligibility page. 5. Does the USDA enforce any restrictions on property location? Yes. 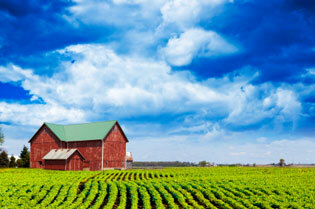 USDA loans can only apply toward home purchases in areas deemed “rural” by the USDA. Fortunately, this definition is fairly open and includes many small towns, suburbs, and exurbs of most major cities. Most homes just outside of major cities qualify. To find out if your prospective home purchase satisfies this requirement, visit the official USDA Property Eligibility page. 6. Is the loan process for acquiring a USDA loan similar to those of other loan types? For borrowers, securing a USDA mortgage loan involves the same process as that of any other home loan program. Rural Development loans require your normal lender underwriting time specifications, plus an additional 7 - 14 days for the USDA to review your application. 7. What are the eligibility requirements for USDA loans? While USDA loans include many unique and specific requirements for both the borrower and property, the main considerations for USDA loan eligibility involve monthly income, credit history, debt-to-income ratio, and property location. The most defining requirement of the USDA loan is that the prospective property must be situated in an area deemed “rural” by the USDA. While this may seem to severely limit a number of eligible borrowers, the USDA defines rural quite loosely, and many small towns, suburbs, and exurbs of major cities qualify. For a comprehensive explanation of USDA eligibility guidelines, visit our Lender411 USDA Loan Requirements page. 8. Can I obtain a USDA mortgage after a bankruptcy? As with other loan programs, USDA loans include a mandatory waiting period for borrowers who have recently filed for bankruptcy. Borrowers who have undergone a Chapter 7 bankruptcy must wait a minimum of 3 years from the discharge date before regaining USDA eligibility. For Chapter 13 bankruptcy, borrowers must wait a minimum of one year, provided that all court payments have been made on time. 9. What are the down payment requirements for USDA loans? None. The loan requires zero down payment. If the home appraises for higher than your purchase price, you can potentially even finance up to 102% of the purchase price to help cover closing costs. USDA loans are one of the few available loan programs with this advantage. 10. Can USDA loans be used to purchase all property types? Although USDA guidelines specify that the mortgage owner must occupy the property, borrowers can purchase condos, planned unit developments, manufactured homes, and single-family residences with rural development loans. But, be aware, the USDA loan does not allow for the property to be income producing. Therefore no farms, or multifamily properties. 11. How much can I borrow using a USDA loan? While USDA loans do not include a maximum loan limit amount, they are restricted by borrower debt ratios and income restrictions. To qualify for a USDA mortgage loan, borrowers must have a debt-to-income ratio (DTI) that does not exceed 29% for potential mortgage debt and 41% for total monthly debt. This means mortgage payments cannot exceed 29% of a borrower’s gross monthly income and total monthly debt payments cannot exceed 41% of a borrower’s gross monthly income. As with most loans, with good compensating factors, a borrower may go slightly over those ratio requirements. Regarding financing, USDA loans can finance up to 102% of the total appraised value, allowing borrowers to include a portion of the closing costs and guarantee fee within the loan balance. 12. What are the mortgage options for USDA loans? Unlike other government-backed loan programs, USDA loans do not offer a wide variety of mortgage options. In fact, all USDA loans are 30-year fixed-rate mortgages, with interest rates remaining constant over the full duration of the loan. Monthly mortgage payments will therefore never increase, meaning borrowers can anticipate these expenses and budget accordingly. 13. What are the USDA Rural Development loan limits? While the USDA does not enforce a maximum loan limit for Rural Development loans, the amount that a borrower can secure will be limited by the appraisal value of the property, as well as the borrower’s debt-to-income ratio. 14. Can I finance USDA closing costs into the loan balance? Borrowers who have not set aside funds for closing costs may finance any difference between the contract price and the home’s appraised value into the mortgage balance, up to 102%. As with most other loans, you can also have the seller pay your closing costs, up to 6% of the loan amount. 15. What is the USDA loan guarantee? Although referred to as a USDA loan, these loans are not originated by the USDA. The USDA insures these mortgages in the event of borrower default, guaranteeing to protect the lender from taking substantial losses. Government loans constitute assistance programs, which often provide loan accessibility to riskier buyers with poor credit or higher debt-to-income ratios. To give lenders incentive to fund these mortgages, the USDA will repay up to 90% of a borrower’s outstanding debt in the event of default. With less risk to assume, lenders can approve these loans with less strict underwriting guidelines, one of the most advantageous qualities of government-backed loans. It is hard to beat the flexibility and great rates of USDA rural housing loans. These programs are geared toward home buyers who live in rural areas of the country and who have little to no money to put down. USDA rural housing loan programs offer flexible, common sense underwriting guidelines, relaxed credit requirements, low PMI (private mortgage insurance) options, the ability to finance closing costs into the loan amount, lenient seller concessions, and rates that are comparable to, if not better than, conventional fixed rate mortgage programs. Contact your trusted mortgage advisor to get the process started on a USDA Rural Development Home Mortgage. Get a Free Quote! Get a USDA Loan!